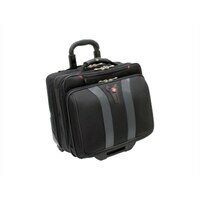 SwissGear GRANADA - Laptop carrying case - 17-inchThe Granada Wheeled Computer Case from Swiss Gear lets you organize the day's chores by easily fitting most 15.6" laptops. It features Comp-u-Flex computer pocket with an overnight compartment and space for expanding files. It incorporates easy glide in-line wheels with a secure lock telescoping handle. It is a must have accessory for your business needs. The Granada Wheeled Computer Case from Swiss Gear lets you organize the day's chores by easily fitting most 15.6" laptops. It features Comp-u-Flex computer pocket with an overnight compartment and space for expanding files. It incorporates easy glide in-line wheels with a secure lock telescoping handle. It is a must have accessory for your business needs.